NAGPUR: Thousands of Nagpurians who had thought of having a good time listening to the soothing music of maestro A R Rahman on Sunday were in for a rude shock as the show turned out to be a logistic nightmare. Neither the number of seats were adequate nor was the parking space. The fans who reached the venue early got a place to park their vehicles and a seat. They enjoyed a scintillating performance of the academy award winner and his team. But those arrived a bit late had to miss first half of the show and many had to watch the performance - organized by Bodhi Foundation - without a seat. If this were not enough, police stopped the concert at 10.15 pm in middle of a song 'Pray for my brother' because of the time limit. 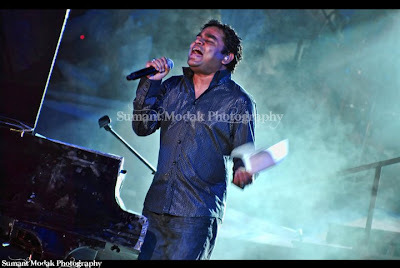 A disgusted Rahman told the audience that if they wanted to listen to rest of the concert they should come to Bangalore. Police commissioner Ankush Dhanvijay justified the decision saying that law was same for everybody. Many ticket holders did not even get to listen to one song. Raju Madan spent Rs 25,000 and got a two hour long traffic jam in return. "Since last one and a half hours I have been trying to find a place to park my car. The traffic is moving so slowly that I can't even go back," a disgusted Madan said at around 8.30 pm. Such was the chaos that even the ministers and top bureaucrats were inconvenienced. Friends and relatives of the volunteers entered the VIP area in front of the stage and blocked the view. Police personnel had to repeatedly make them sit down. Many sat at the feet of VIPs. Tempers ran high among VIPs. A woman from a prominent family poured water on a police officer who was occupying her seat. This led to exchange of expletives. The scene behind the VIP area was worse. The number of seats for Rs 1,000 pass were not enough. Many entered the space meant for Rs 2,000 pass holders. "Despite having bought Rs 1,000 tickets, we were treated like beggars. People snatched chairs from each other," said Dr Sunita Mahatme. Another fan Neha Chouharia complained there was no trace of organizers to control the situation. Fans were infuriated over traffic control. DCP (Traffic) Sahebrao Patil, however, said that his men had done their best to control the traffic. "The parking space is inadequate for 15,000 vehicles. There is no space left. If we had not been present, the chaos would have continued for the whole night," he said in the middle of a kilometre long traffic jam. Those who did get to hear were literally left asking for more as the maestro belted out his favourite numbers mixing them with less known ones, including a Tamil song. Teaming up with artists Remo Fernandes, Shivmani, Gurpreet, he provided the capacity crowd their money's worth. The audience left wishing the same could be said of the organizers.